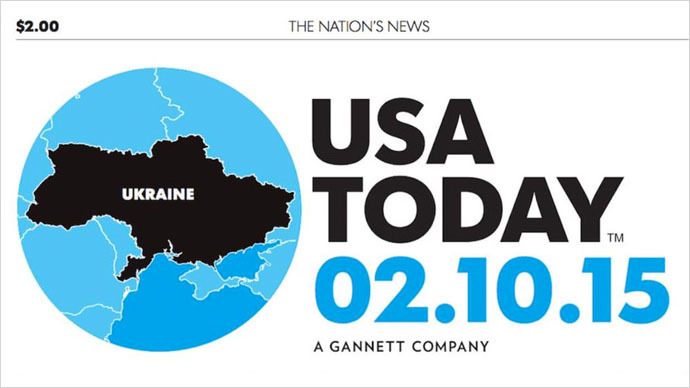 USA Today, one of the biggest American newspapers, published on its front page a map of Ukraine - not showing Crimean Peninsula as part of it. The perception challenges the Western stance declaring Crimea’s joining Russia illegal. The map is part of the newspaper’s coverage of Wednesday’s meeting in Minsk to negotiate a truce in the Ukrainian civil war. It was not immediately clear whether excluding Crimea was a mistake or an editorial choice. Crimea is a former region of Ukraine, which voted in a referendum to split from the country after an armed coup ousted its elected government. Crimean people asked Moscow to accept the region as part of the Russian Federation, which it did. Kiev and its Western sponsors viewed it as an illegal annexation through military force and imposed sanctions against Russia over the move. Moscow insists the Crimean people exercised their right to self-determination in full compliance with the UN Charter and other international laws. The disputed sovereignty over Crimea is part of a wider Ukrainian crisis that sent the world into the most serious confrontation since the end of Cold War. The USA Today publication comes days after CNN made a Ukraine-related gaffe, labeling the national army as “pro-US troops.” The news channel apologized for the mistake, which many sarcastic commenters called a Freudian slip-of-tongue.